| Shaping the Future | uses ultrasound energy, produces less heat and fewer complaints. I do a lot of fat grafting and the fat removed with the ultrasonic energy is still viable in most cases." Dr. Hartog also ﬁnds that Vaser is more efﬁcient and therefore works well on heavier patients, as well as those with denser tissue and those who have had liposuction before, noting that patients experience less bleeding with Vaser than they do with traditional non-energy systems. Water−Based Alternatives Dr. Wall is critical of liposuction techniques that rely on heat. "It's pretty indisputable that all of the internal thermal devices—ultrasound, laser, radiofrequency—create internal burns and are destructive to cells and tissues," he explains. "The scar tissue that is generated after treatment with thermal devices can be much harder to correct, in my experience with revision cases." "If patients need skin tightening as well as fat removal, energy− based liposuction is the best option." Dr. Hartog agrees that laser energy can be dangerous if injudiciously used, but he embraces ultrasonic energy devices such as Vaser LipoSelection (Solta Medical, solta.com). "If patients need skin tightening as well as fat removal, energy-based liposuction is the best option," notes Hartog. He has stopped using laser systems, because in his experience, the heat levels result in skin contraction and scariﬁcation. "Patients sometimes complain that remaining tissue feels like Styrofoam," he says. "The Smartlipo is highly skill-dependent and can be dangerous in the wrong hands. Vaser, which 16 Surgical Aesthetics ❘ January/February 2014 Patient Selection "My two main criteria for deciding the best method of liposuction are the volume of fat to be removed and the quality of the skin in the surgical area," says Dr. Hartog. "Young, healthy patients who simply want some bulges removed will do ﬁne with traditional tumescent liposuction. Someone with skin laxity who wants a small volume removed may beneﬁt from the addition of laser-based energy, while those requiring higher volumes of fat removal may do best with Vaser or a water-based system like Hydrasolve." 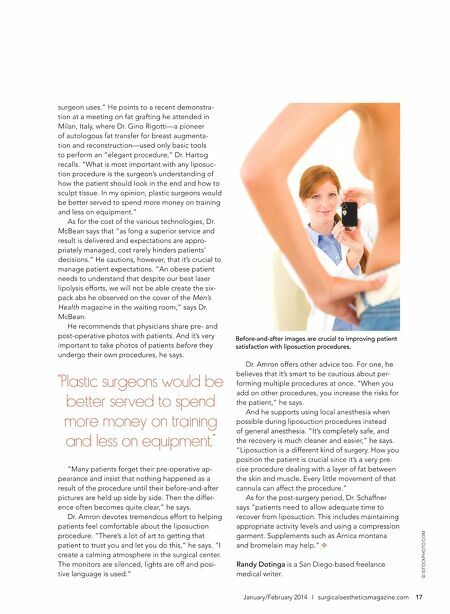 Physicians should adopt the liposuction technology that they feel most comfortable using, advises Dr. Lahijani. "There's nothing like hands-on experience. It takes time to improve your technique, and you learn a little something each time you perform a procedure," he says. Dr. Hartog agrees: "In the end, the skill of the surgeon will have more to do with the outcome a patient receives than the liposuction method the © ISTOCKPHOTO.COM The patient's skin quality and the volume of fat to be removed often dictate the types of equipment that will offer the most beneﬁt. Dr. Hartog is also a fan of newer water-based devices like the Body-jet (mybodyjet.com) and Hydrasolve (Andrew Technologies, hydrasolve.com), which he says make fat tissue removal easier by breaking it down, and are great for high fat volume removal. "They minimize blood loss and the fat removed is great for grafting once the water has been removed," Hartog explains. "They do require the use of disposables that create additional expense you must pass on to patients." The Hydrasolve system uses pulsed packets of warmed saline solution to liquefy fat tissue without the cutting, shearing and forceful thrusting of traditional liposuction. The warmed water makes it more efﬁcient than the Body-jet, according to Dr. Hartog. The FDA recently approved the use of the Hydrasolve system for autologous fat transfer.